I have a little demonstration set up in the lab where it teach. It's a hand-crank generator powering a motor that spins a fan. It's pretty easy to turn the crank and make the fan go, until I flip a switch that puts an incandescent light bulb in parallel with the fan motor. As you can probably guess, the additional load causes a slight drop in the generator's output voltage. What's less intuitive, however, is that it becomes very difficult to turn the crank. The extra load causes the generator to literally slow down. Since a generator's frequency is proportional to its rotational speed, the output frequency also decreases. What I just described is the principle behind regenerative braking in a car, where charging the battery becomes the additional load. But a feature in one application (electric vehicles) turns out to be a flaw in power generation systems. We want the car to slow down when we apply the brakes, but we don't want the grid's frequency to change when a new load is added. Synchronous AC motors and many timing circuits depend on that frequency being solid; any variation could cause machines to malfunction or shut down, hence the need to regulate the grid's frequency. Traditionally, generators ramp up their output to compensate for the dip in frequency. For rotating machines, this usually entails burning more fuel. The traditional approach has three problems: first, it's slow to respond, often taking several minutes to make a correction; second, it sometimes overcompensates, causing the frequency to go above its nominal value; and third, it wastes fuel. Modern grid operators are now looking to energy storage systems - flywheels, supercapacitors, and batteries - to take on the job of frequency regulation. Their advantages are threefold: faster response time, more precise control over frequency, and fuel savings. Between August 2015 and January 2016, Kokam has brought 56 megawatts (20 MWh) of batteries online in South Korea, for the sole purpose of frequency regulation. But the work doesn't stop there; by the end of 2017, South Korea expects to increase that number to 500 MW. South Korea's largest utility, Korea Electric Power Corporation (KEPCO), says that the energy storage system (ESS) will cut its fuel expenditures by $13M per year. Over the life of the ESS, the savings will add up to more than triple the purchase price - a pretty nice return on investment for the utility. Moreover, the ESS will provide better frequency regulation and decrease wear and tear on the generators. Finally, the added storage and frequency regulation will pave the way for more renewable energy on the grid. Kokam's energy storage systems are built around its patented Ultra High Power Nickel Manganese Cobalt (NMC) battery technology, a variation of Li-ion chemistry. NMC batteries can be optimized to deliver either high power density or high energy density. For frequency regulation, power density is the choice. 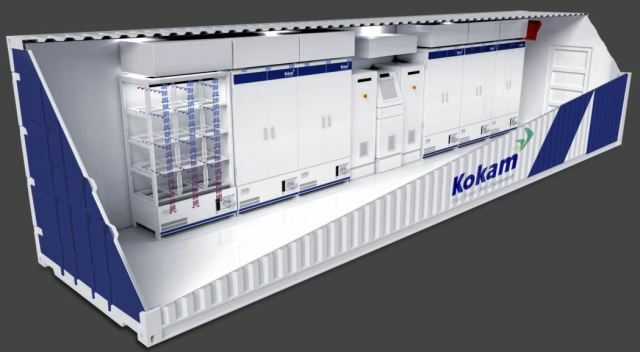 According to Ike Hong, VP of Kokam’s Power Solutions Division, "Though Kokam’s Ultra High Power NMC battery technology is optimized for power density, it also delivers strong energy density performance. For example, Kokam’s 75 Ah Ultra High Power NMC Cell features exceptional energy density of 153 Wh/kg and 337 Wh/L. Yet it manages to combine this energy density with discharge power capacity up to 15 C-rate of original capacity." A surface treatment that is applied to the cathode to improve high power performance. This surface treatment improves Lithium dispersion, which minimizes electron and ion transfer resistance, enhancing the battery’s power density and lengthening its life (10,000 cycles, compared to 3,000 - 5,000 cycles for standard NMC technologies). A Z-Folding design which minimizes internal resistance, (50% lower internal resistance than other battery technologies) resulting in less energy loss. A pouch type cell structure, rather than a prismatic cell structure. A pouch type cell structure is more effective in letting out heat, resulting in a heat dissipation rate that is 1.6 times better than standard NMC technologies. This enables Ultra High Power NMC batteries to be used at a higher rate for longer periods of time with no degradation in battery life or performance." 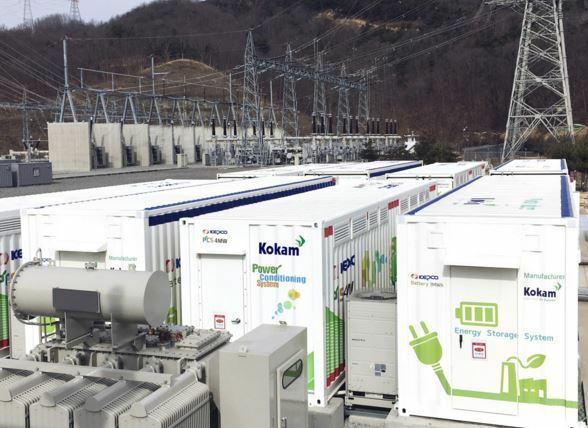 Kokam's contract with KEPCO won't allow the company to reveal the cost per kWh of storage, but Mr. Hong told me that the cost is on par with its competitors' NMC technology. Kokam's energy storage systems are enclosed in a 40 foot (12 m) container. A unique direct cooling system (shown below) regulates only the rack temperatures rather than cooling the entire container. According to Kokam, direct cooling requires 70% less HVAC energy than ambient cooling in a similar container. Energy storage is the limiting factor in renewable energy systems, electric vehicles, and microgrids. As batteries are used in more applications, we'll see a steady decrease in their cost and a gradual increase in performance. That's good news for industry and consumers alike. A note to aspiring engineers: if you're into chemistry, think about pursuing battery technology! Images courtesy of Kokam Co., Ltd. Follow Dr. Tom Lombardo on Twitter, LinkedIn, Google+, and Facebook.